Geo.F.Trumper Almond Hard Shaving Soap Refill 80gr. An 80g refill of the famous glycerine based Almond Shaving Soap, designed to fit the wooden shaving bowls. With a distinctive sweet, nutty fragrance. These shaving soaps are finely refined soap, which is both smooth, long lasting and of the highest quality, with a good lather. These are superior in quality to triple milled soaps. Ingredients: Sodium Palmate, Sodium Palm Kernelate, Aqua (Water), Glycerin, Sodium Cocoate, Parfum (Fragrance), Sodium Chloride, Tetrasodium Glutamate Diacetate, Isopropyl Myristrate, Tetrasodium EDTA, Amyl Cinnamal, Coconut Fatty Acid, Hexyl Cinnamal, BHT, Coumarin, Butylphenyl Methylpropional, Limonene, Citronellol, Linalool, Geraniol, CI 77891, CI 19140.1, CI 73360. Geo.F.Trumper Almond Hard Shaving Soap Wooden Bowl 80gr. The glycerine based Almond hard shaving soap in a wooden bowl. These shaving soaps are refined soap, which is smooth, long lasting and of the highest quality, with a good lather. 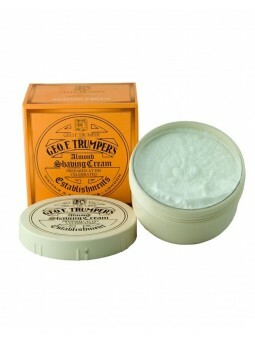 Geo.F.Trumper Almond Soft Shaving Cream Bowl 200gr. This glycerine based almond soft shaving cream is in a large 200g screw thread bowl. With a sweet, nutty scent. Only a small amount is required for each shave to produce a luxurious lather. Ingredients: Aqua (Water), Stearic Acid, Myristic Acid, Potassium Hydroxide, Coconut Acid, Glycerin, Parfum (Fragrance), Triethanolamine, Sodium Hydroxide, Methylparaben, Propylparaben. 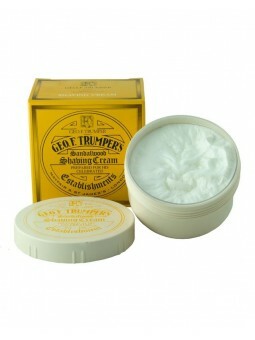 Geo.F.Trumper Coconut Oil Shaving Cream Bowl 200gr. A glycerine based shaving cream, scented with coconut oil. It has nourishing properties, with coconut oil to prevent dryness of the skin. Its lather will be adapted to both normal and sensitive skins. Only a small quantity is required to produce vast quantities of rich lather. 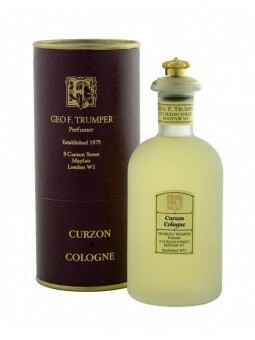 Geo.F.Trumper Curzon Cologne 100ml. Part of our exclusive Trumper Collection of fragrances. Slightly spicy overtones add to a note of chypre. Presented in an exclusive glass crown topped bottle and packaged in an outer leatherette drum. Ingredients: Ethanol B Denatured, Fragrance, Limonene, Alpha Isomethyl Ionone, Linalool, Hexyl Cinnamal, Hydroxycitronellal, Eugenol, Citronellol, Coumarin, Hydroxyisohexyl 3-Cyclohexene Carboxaldehyde, Butylphenyl Methylpropional, Benzyl Benzoate, Evernia Furfuracea (treemoss) extract, Evernia Prunastri (oakmoss) extract, Geraniol, Citral, Cinnamal, Isoeugenol. Geo.F.Trumper. Eucris Eau de Cologne 100ml. 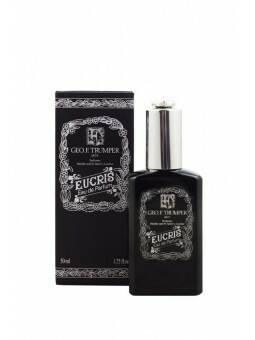 Striking fragrance of Eucris sweeps the gentleman into the realms of utter sophistication and pleasure. The warm, sensual beauty of sandalwood, musk and moss is enhanced by a heart of rich, honey-like jasmine and exquisite muguet. Rousing, peppery top notes of cumin and coriander radiate with the fullness of plump blackcurrants. The Eucris Eau de Parfum is designed to be long lasting with just a small quantity applied to the skin. Ingredients: Alcohol Denat., Parfum (Fragrance), Aqua (Water). Geo.F.Trumper. Eucris Eau de Parfum 50ml. An Eau de Parfum with the incredible fragrance of Eucris. The warm, greatness of sandalwood, musk and moss with a heart of rich, honey-like jasmine and muguet. The top notes of cumin and coriander radiate with the fullness of plump blackcurrants. The Eucris Eau de Parfum is designed to last a long time even with a small quantity. Presented in a black and silver 50ml atomiser bottle. Geo.F.Trumper Eucris Soft Shaving Cream Tube 75gr. A soft shaving cream, now available with the great scent of the Eucris cologne. Ingredients: Aqua (Water), Stearic Acid, Myristic Acid, Potassium Hydroxide, Coconut Acid, Glycerin, Parfum (Fragrance), Triethanolamine, Sodium Hydroxide, Methylparaben, Propylparaben, Coumarin, Evernia Furfuracea Extract. 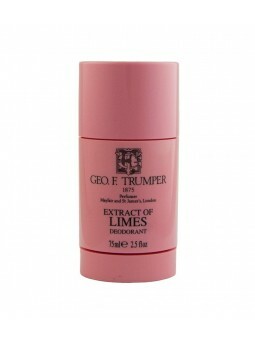 Geo F. Trumper Extract Limes Skin Food 100ml. A versatile requisite of the grooming ritual, skin food is ideal before or after the shave. As a pre-shave for sensitive skin, massaging Trumper's skin food against the growth of the beard lifts and softens the bristles in preparation. Its light and non-oily glycerine based formula adds even more nourishment and protection to the skin, and allows the razor to glide easily. The skin is soothed, sealed and offered nourishing relief. 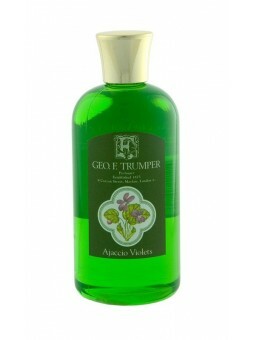 Geo.F.Trumper Extract of Limes 100ml. Every pore is infused thanks to the zest of freshly squeezed West Indian Limes. It contains concentrated essences of West Indian Limes to make for a scent that is fresh and vibrant. Ingredients: Ethanol B, Fragrance, Citral, Geraniol, Limonene, Linalool, Eugenol, Citronellol. 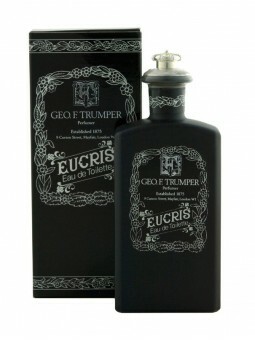 Geo.F.Trumper Extract of Limes Cologne 200ml. Every pore is infused thanks to the zest of freshly squeezed West Indian Limes. 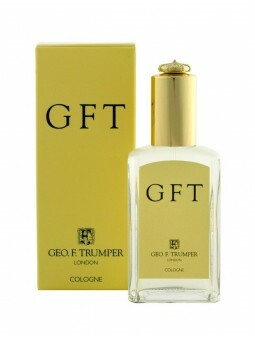 Geo.F.Trumper GFT Cologne 50ml. The GFT scent is fresh and invigorating and has top notes of bergamot and mandarin, lemon , a heart of tarragon, lavender and cypress with musk-like base, cedar and moss. This is an ideal everyday fragrance for the modern gentleman. Ingredients: Alcohol denat., Parfum (Fragrance), Limonene, Aqua (Water), Hydroxycitronellal, Linalool, Citronellol, Citral, Geraniol, Butylphenyl methylpropional, Benzyl benzoate, Benzyl Salicylate, Farnesol. 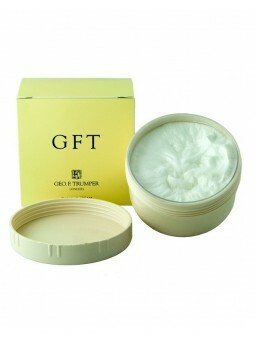 Geo.F.Trumper GFT Soft Shaving Cream Bowl 200gr. This glycerine based soft shaving cream is scented with the GFT fragrance. Presented in a large 200g screw thread bowl. Ingredients: Aqua (Water), Stearic Acid, Myristic Acid, Potassium Hydroxide, Coconut Acid, Glycerin, Parfum (Fragrance), Triethanolamine, Sodium Hydroxide, Methylparaben, Propylparaben, Citronellol, Linalool, Citral, Hydroxycitronellal, Limonene. 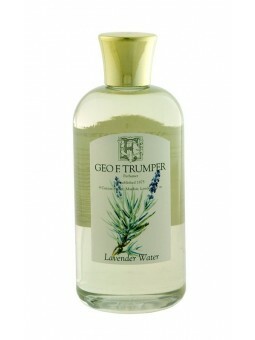 Geo.F.Trumper Lavender Water 100ml. The fresh, woody aroma of English Lavender with patchouli and clary sage. With warm undertones of Sandalwood and notes of Oak Moss and Peppermint Oil. Lavender Water may be splashed onto the skin or into a bath. Ingredients: Ethanol B, Aqua (Deionised Water), Parfum (Fragrance), Benzyl Benzoate, Benzyl Cinnamate, Isoeugenol, Citral, Evernia Prunastri, Citronellol, Limonene, Eugenol, Geraniol, Coumarin, Benzyl Alcohol, Linalool. 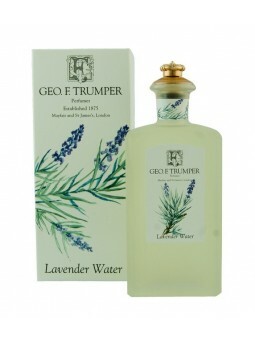 Geo.F.Trumper Lavender Water 200ml. The fresh, woody aroma of English Lavender with patchouli and clary sage. With warm undertones of Sandalwood and notes of Oak Moss and Peppermint Oil. Lavender Water may be splashed onto the skin or into a bath. Geo F. Trumper Lime Hard Shaving Soap Refill 80gr. A hard shaving soap refill with a great limes scent. These shaving soaps are finely refined soap, which is both smooth, long lasting and of the highest quality, with a good lather. Ingredients: Sodium Palmate, Sodium Palm Kernelate, Aqua (Water), Glycerin, Sodium Cocoate, Parfum (Fragrance), Sodium Chloride, Tetrasodium Glutamate Diacetate, Limonene, Isopropyl Myristrate, Linalool, Citral, Tetrasodium EDTA, Alpha-Isomethyl Ionone, Coconut Fatty Acid, BHT, Coumarin, CI 77891, CI 19140.1, CI 19140, CI 77288. 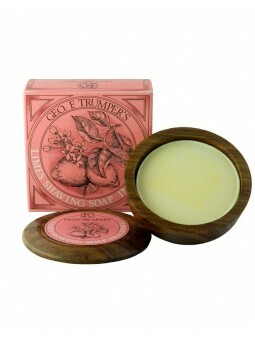 Geo.F.Trumper Lime Hard Shaving Soap Wooden Bowl 80gr. A hard shaving soap in an elegant wooden shaving bowl, with a great limes scent. Geo.F.Trumper Limes Soft Shaving Cream Bowl 200gr. This glycerine based Limes Soft Shaving Cream is presented in a 200g screw thread bowl. Just a small amount produces vast quantities of rich lather. Ingredients: Aqua (Water), Stearic Acid, Myristic Acid, Potassium Hydroxide, Coconut Acid, Glycerin, Parfum (Fragrance), Triethanolamine, Sodium Hydroxide, Methylparaben, Propylparaben, CI 19140 (FD & C Yellow 5), CI 42090 (FD & C Blue 1), CI 14700 (FD& C Red 4), Alpha-Isomethyl Ionone, Benzyl Benzoate, Citral, Coumarin, Hexyl Cinnamal, Limonene, Linalool. 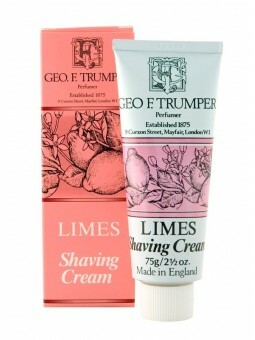 Geo.F.Trumper Limes Soft Shaving Crem Tube 75gr. This glycerine based Limes Soft Shaving Cream is presented in a traditional metal tube for use both at home or when travelling. Only a small quantity is required to produce vast qunatities of rich lather. Geo.F.Trumper Marlborough Cologne 100ml. This is Part of the exclusive Trumper Collection. An aromatic scent revealing geranium ,lavender and cedarwood. Presented in an exclusive glass crown topped bottle and packaged in an outer leatherette drum . Ingredients: Ethanol B Denatured, Limonene, Linalool, Hexyl Cinnamal, Benzyl Alcohol, Cinnamyl Alcohol, Evernia Furfuracea (treemoss) extract, Isoeugenol, Citral, Geraniol, Citronellol, Eugenol, Benzyl Salicylate, Benzyl Benzoate. Geo.F.Trumper Rose Soft Shaving Cream Bowl 200gr. This rose, glycerine based, soft shaving cream is in a screw thread pot. Only a small quantity is required to produce vast quantities of lather. 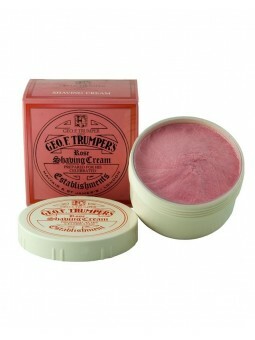 Trumper's rose shaving cream is suitable for sensitive skin. Ingredients: Aqua (Water), Stearic Acid, Myristic Acid, Potassium Hydroxide, Coconut Acid, Glycerin, Parfum (Fragrance), Triethanolamine, Sodium Hydroxide, Methylparaben, Propylparaben, CI 17200 (FD & C Red 33), CI 16035 (FD & C Red 40), Citronellol, Cinnamyl Alcohol. 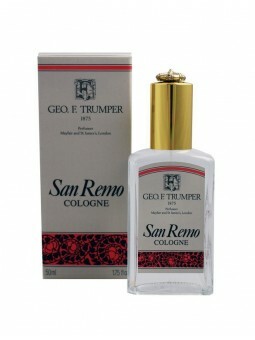 Geo.F.Trumper San Remo Cologne 50ml. San Remo is the City of flowers, famous for its Riviera glamour and its sub-tropical vegetation and surroundings. The fragrant air is a mix of Palm Trees, Cactuses, Carnations, Roses and Begonias. This San Remo mix is a reminder of the winds going from the Alps to the coast, soft, subtle and intoxicating. Ingredients: Alcohol Denat., Parfum (Fragrance), Aqua (Water), Linalool, Geraniol, Limonene, Citronellol, Benzyl Benzoate, Benzyl Salicylate, Farnesol, Isoeugenol. 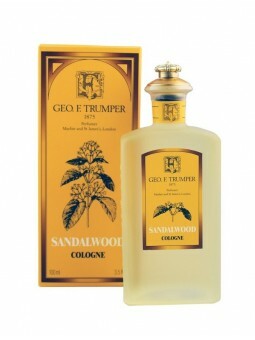 Geo.F.Trumper Sandalwood Cologne 100ml. Mystery and sensuality smoulder under the velvet layers of this Sandalwood Cologne, with woody warmth and the suggestion of pepper from its great depths. The opulence of this scent is a homage to the masculine form. Packaged in a traditional 100ml Glass Crown Sprinkler Top Bottle. Ingredients: Ethanol B, Fragrance, Benzyl Alcohol, Isoeugenol, Farnesol, Cinnamyl Alcohol, Cinnamal, Benzyl Benzoate, Citral, Citronellol, Benzyl Salicylate, Eugenol, Coumarin, Geraniol, Limonene, Linalool. 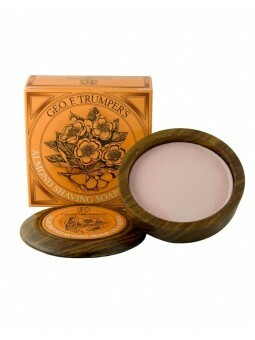 Geo.F.Trumper Sandalwood Hard Shaving Soap Refill 80gr. A sandalwood hard shaving soap refill for the wooden shaving soap bowls. Lightly fragranced and suitable for sensitive skin. Ingredients: Sodium Palmate, Sodium Palm Kernelate, Aqua (Water), Glycerin, Sodium Cocoate, Parfum (Fragrance), Sodium Chloride, Tetrasodium Glutamate Diacetate, Isopropyl Myristrate, Coumarin, Tetrasodium EDTA, Linalool, Citronellol, Alpha-Isomethyl Ionone, Eugenol, Coconut Fatty Acid, Geraniol, BHT, Benzyl Salicylate, Limonene, Calcium Carbonate, CI 77891, CI 77492, CI 77491. Geo.F.Trumper Sandalwood Hard Shaving Soap Wooden Bowl 80gr. A sandalwood hard shaving soap in a hand turned wooden bowl. 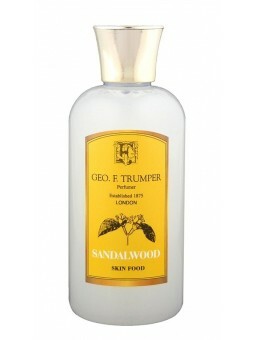 Geo F. Trumper Sandalwood Skin Food 100ml. A versatile requisite of the grooming ritual, skin food is ideal before or after the shave. As a pre-shave for sensitive skin, massaging Trumper's skin food against the growth of the beard lifts and softens the bristles in preparation. Its light and non-oily glycerine based formula adds even more nourishment and protection to the skin, and allows the razor to glide easily. The skin is soothed, sealed and offered nourishing relief. With a classic sandalwood fragrance. 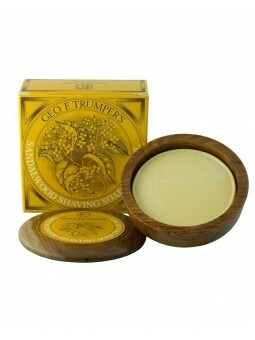 Geo.F.Trumper Sandalwood Soft Shaving Cream Bowl 200gr. This glycerine based, sandalwood soft shaving cream is in a screw thread pot. Ingredients: Aqua (Water), Stearic Acid, Myristic Acid, Potassium Hydroxide, Coconut Acid, Glycerin, Parfum (Fragrance), Triethanolamine, Sodium Hydroxide, Methylparaben, Propylparaben, Benzyl Benzoate, Benzyl Salicylate, Coumarin, Limonene, Linalool, Alpha-Isomethyl Ionone. 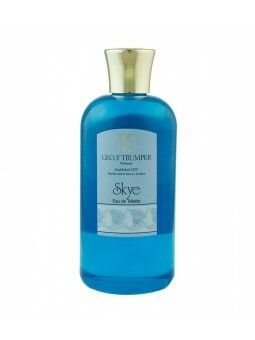 Geo.F.Trumper Skye Eau de Toilette 100ml. A distinctive bouquet including a fantastic blend of eleven essences in all. Strong, fresh tones of Rosemary are enchanted by the stunning aroma of geranium bourbon. The top notes are floral-jasmine Ylang Ylang arch amidst the notes of musk. Ingredients: Ethanol B, Parfum (Fragrance), Benzyl Alcohol, Eugenol, Isoeugenol, Citral, Farnesol, Benzyl Salicylate, Citronellol, Benzyl Benzoate, Limonene, Geraniol, Linalool. 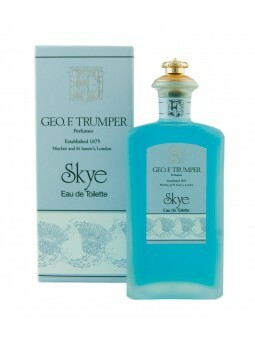 Geo.F.Trumper Skye Eau de Toilette 200ml. A distinctive bouquet including a fantastic blend of eleven essences in all. 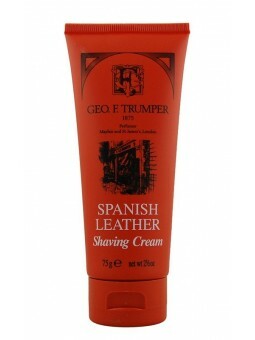 Geo.F.Trumper Spanish Leather Soft Shaving Crem Tube 75gr. A soft shaving cream fragranced with the scent of Spanish Leather Cologne. Ingredients: Aqua (Water), Stearic Acid, Myristic Acid, Potassium Hydroxide, Coconut Acid, Glycerin, Parfum (Fragrance), Triethanolamine, Sodium Hydroxide, Methylparaben, Propylparaben, Benzyl Salicylate, Citronellol, Coumarin, Eugenol, Evernia Furfuracea Extract. Geo.F.Trumper Violet Soft Shaving Cream Bowl 200gr. A Violet soft shaving cream in a screw thread pot. Delicately fragranced and suitable for sensitive skin. Ingredients: Aqua (Water), Stearic Acid, Myristic Acid, Potassium Hydroxide, Coconut Acid, Glycerin, Parfum (Fragrance), Triethanolamine, Sodium Hydroxide, Methylparaben, Propylparaben, CI 17200 (FD & C Red 33), CI 42090 (FD & C Blue 1), Alpha-Isomethyl Ionone, Citronellol, Eugenol, Hexyl Cinnamal, Hydroxycitronellal, Butylphenyl Methylpropional. 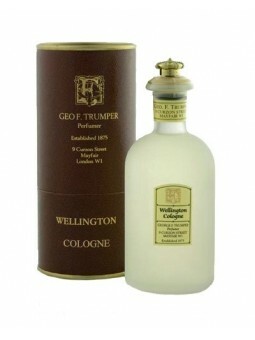 Geo.F.Trumper Wellington Cologne 100ml. This is part of the exclusive Trumper Collection of fragrances. A great fragrance that mixes musk with complex top notes of Neroli and Rosemary . Ingredients: Alcohol denat., Parfum (Fragrance), Limonene, Linalool, Citral, Geraniol, Hydroxycitronellal, Citronellol, Benzyl benzoate, Benzyl alcohol, Eugenol, Isoeugenol, Benzyl salicylate, Coumarin. 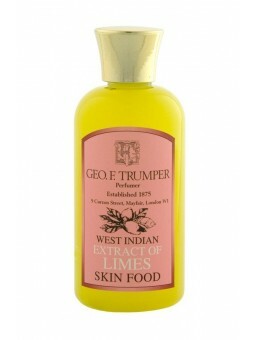 Geo F. Trumper West Indian Extract of Limes After Shave 100ml. This After Shave lotion calms the skin and closes its pores after the shave. It gives the skin its natural glow and vitality back thanks to its active ingredients. Presented in a 100ml crystal bottle with a restriction of flow that allows easy application with the adequate quantity. Its concentrated fragrance with a base of West Limes essences, give you a fresh and vibrant touch. With brilliant aroma explosions that recharge you with strength thanks to the citric and acid touch of the tropical limes. Each skin pore is filled with the limes aroma for a stimulating sensation. 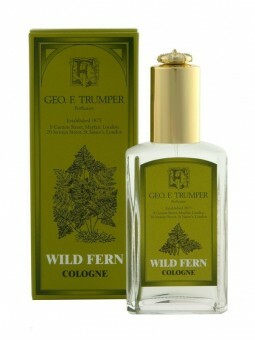 Geo.F.Trumper Wild Fern Cologne 50ml. The warm fougere aroma is made greater by sensual, woody notes thanks to musk and oak moss, as well as a hint of pachouli. A magical and unique experience. Ingredients: Ethanol B Denatured, Parfum (Fragrance), Geraniol, Linalool, Coumarin, Citronellol, Limonene, Evernia Furfuracea (Treemoss) Extract, Citral, Eugenol. Geo.F.Trumper Astor Cologne 100ml. One of the exclusive Trumper Collection fragrances. Caraway and Sandalwood for a gentle and light fragrance. Presented in a glass crown topped bottle and packaged in an outer leatherette drum. Ingredients: Ethanol B Denatured, Eugenol, Coumarin, Hydroxycitronellal, Linalool, Butylphenyl Methylpropional, Limonene, Citronellol, Geraniol. Geo.F.Trumper Coconut Hard Shaving Soap Refill 80gr. An 80g refill of the famous glycerine based Coconut Shaving Soap, designed to fit the wooden shaving bowls. With such first-rate nourishing properties, shaving with coconut oil will prevent dryness to the skin. Both sensitive and normal skin will luxuriate in its rich lather. Ingredients: Sodium Palmate, Sodium Palm Kernelate, Aqua (Water), Glycerin, Sodium Cocoate, Parfum (Fragrance), Coumarin, Sodium Chloride, Tetrasodium Glutamate Diacetate, Isopropyl Myristrate, Tetrasodium EDTA, Coconut Fatty Acid, BHT, CI 77891, CI 77492. 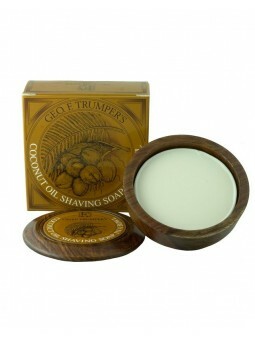 Geo.F.Trumper Coconut Hard Shaving Soap Wooden Bowl 80gr. The famous glycerine based Coconut Hard Shaving Soap in an elegant hand turned wooden bowl. With such first-rate nourishing properties, shaving with coconut oil will prevent dryness to the skin. 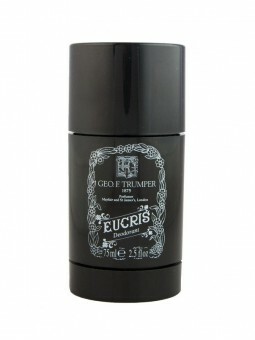 Geo.F.Trumper Eucris Deodorant Stick 75ml. A glycol based deodorant stick fragranced with the scent of the Eucris EDT. Provides a fresh scent throughout the day. Contains glycerine and vitamin E. Alcohol and triclosan free. Ingredients: Propylene Glycol, Butylene Glycol, Aqua (Water), Sodium Stearate, Poloxamer 407, Parfum (Fragrance), Oleth-20, Ethylhexylglycerin, Tocopheryl Acetate, Coumarin, Treemoss Extract. Geo.F.Trumper Eucris Hard Shaving Soap Refill 80gr. 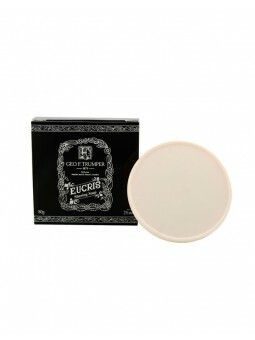 The glycerine based hard shaving soap scented with the fragrance of theEucris EDT. To fit the 80g wooden shaving bowls. Ingredients: Sodium Palmate, Potassium Stearate, Sodium Cocoate, Sodium Stearate, Aqua (Water), Potassium Cocoate, Glycerin, Parfum (Fragrance), CI 77891, Tetrasodium EDTA, Sodium Chloride, Isopropyl Myristate, Tetrasodium Etidronate, Evernia Furfuracea, BHT, Coumarin. Geo.F.Trumper Eucris Hard Shaving Soap Wooden Bowl 80gr. 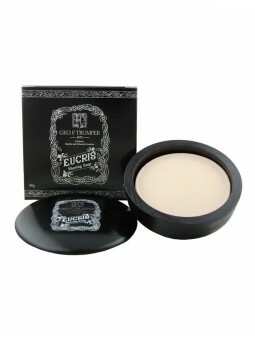 The glycerine based hard shaving soap with the scent of Eucris EDT. Presented in a special edition black wooden shaving bowl. Ingredeients: Sodium Palmate, Potassium Stearate, Sodium Cocoate, Sodium Stearate, Aqua (Water), Potassium Cocoate, Glycerin, Parfum (Fragrance), CI 77891, Tetrasodium EDTA, Sodium Chloride, Isopropyl Myristate, Tetrasodium Etidronate, Evernia Furfuracea, BHT, Coumarin. Geo.F.Trumper Extract of Limes Deodorant Stick 75ml. The glycol deodorant stick provides long lasting fragrance to ensure that you stay fresh throughout the day. Alcohol, Aluminium and Triclosan free. Ingredients: Propylene Glycol, Butylene Glycol, Aqua (Water), Sodium Stearate, Poloxamer 407, Parfum (Fragrance), Oleth-20, Ethylhexylglycerin, Tocopheryl Acetate, Citral, Limonene, Linalool. 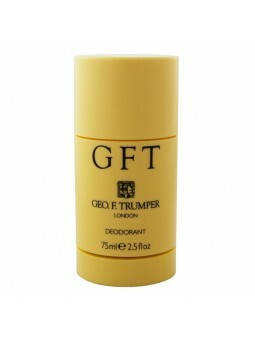 Geo.F.Trumper GFT Deodorant Stick 75ml. A glycol based deodorant stick fragranced with the scent of the GFT cologne. Provides a fresh scent throughout the day. Ingredients: Propylene Glycol, Butylene Glycol, Aqua (Water), Sodium Stearate, Poloxamer 407, Parfum, Oleth-20, Limonene, Ethylhexylglycerin, Hydroxycitronellal, Tocopheryl Acetate (Vitamin E), Citral, Linalool, Citronellol, Geraniol, Sodium Hydroxide, Butylphenyl Methylpropional, Benzyl Benzoate. 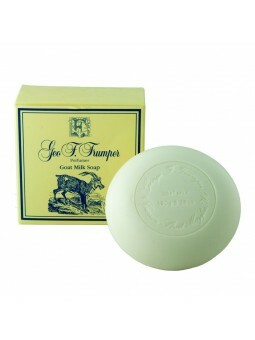 Geo.F.Trumper Goat Milk Bath Soap 150gr. A creamy textured triple milled bath soap containing the extract of Goats Milk. 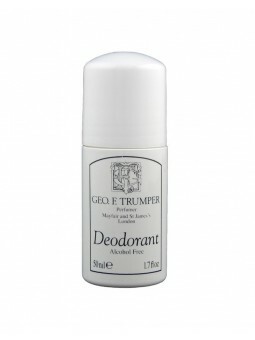 Geo.F.Trumper Roll-On Deodorant 50ml. Trumper's original roll on deodorant/anti perspirant. with a blend of fragrances containing, among others, lemon, bergamot, orange and juniper. Now alcohol free for less irritation. Ingredients: Aqua, Aluminum Chlorohydrate, PEG/PPG-20/6 Dimethicone, PEG-40, Hydrogenated Castor Oil, Parfum, Hydroxyethyl Cellulose, Ethylhexylglycerin, Saccharomyces Ferment, Tricedeth-9, Geraniol, Citral, Benzyl Benzoate, Linalool, Limonene. 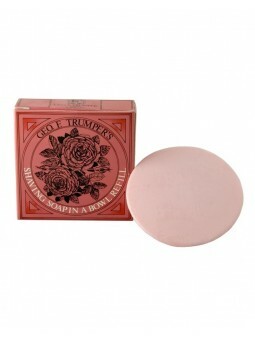 Geo.F.Trumper Roses Hard Shaving Soap Refill 80gr. The famous glycerine based rose hard shaving soap refill for the wooden shaving soap bowls. Ingredients: Sodium Palmate, Sodium Palm Kernelate, Aqua (Water), Glycerin, Sodium Cocoate, Parfum (Fragrance), Sodium Chloride, Tetrasodium Glutamate Diacetate, Isopropyl Myristrate, Geraniol, Citronellol, Hydroxycitronellal, Tetrasodium EDTA, Coconut Fatty Acid, BHT, Linalool, CI 77891, CI 77718, CI 73360. 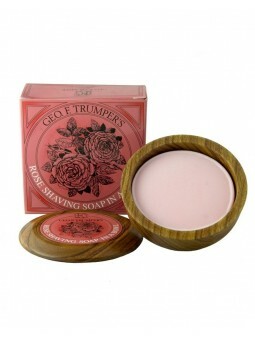 Geo.F.Trumper Roses Hard Shaving Soap Wooden Bowl 80gr. The glycerin based rose hard shaving soap in a hand turned wooden bowl. 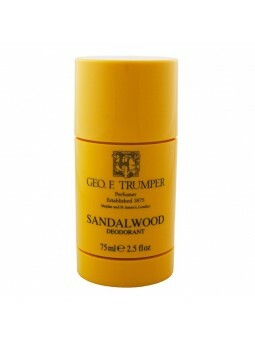 Geo.F.Trumper Sandalwood Deodorant Stick 75ml. A glycol based deodorant stick fragranced with the scent of othe Sandalwood cologne. Provides a fresh scent throughout the day. Ingredients: Propylene Glycol, Butylene Glycol, Aqua (Water), Sodium Stearate, Poloxamer 407, Parfum, Oleth-20, Ethylhexylglycerin, Linalool, Limonene , Tocopheryl Acetate (Vitamin E), Geraniol, Coumarin, Eugenol, Benzyl Salicylate, Sodium Hydroxide, Citronellol, Citral, Benzyl Benzoate. 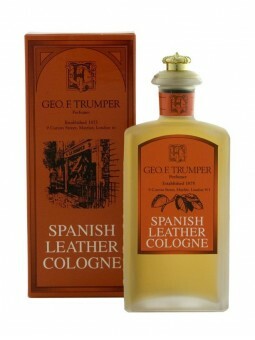 Geo.F.Trumper Spanish Leather Cologne 100ml. With waves of  musk combined with the mysterious, woody spicy tones of patchouli, vanilla and sandalwood to create this amazing scent. Ingredients: Ethanol B, Parfum (Fragrance), Demineralised Water, Coumarin, Citronellol, Benzyl Salicylate, Treemoss Extract, Eugenol, Isoeugenol. 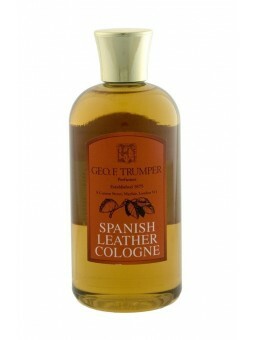 Geo.F.Trumper Spanish Leather Cologne 200ml. With waves of  musk combined with the mysterious, woody spicy tones of patchouli, vanilla and sandalwood to create this amazing scent. 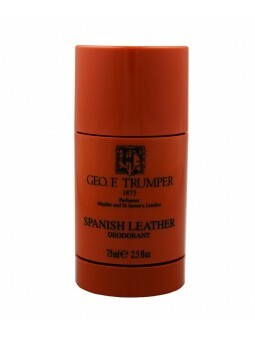 Geo.F.Trumper Spanish Leather Deodorant Stick 75ml. A glycol based deodorant stick fragranced with the scent of the Spanish Leather Cologne. Provides a fresh scent throughout the day. Ingredients: Propylene glycol, Butylene glycol, Aqua (Water), Sodium stearate, Poloxamer 407, Parfum (Fragrance), Oleth-20, Ethylhexylglycerin, Tocopheryl acetate, Coumarin, Citronellol, Benzyl salicylate, Evernia furfuracea extract, Eugenol. 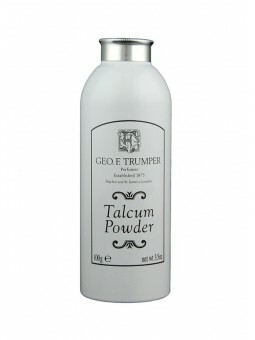 Geo.F.Trumper Talcum Powder 100gr. A fine talc lightly scented with a subtle powdery, floral fragrance. Ingredients: Talc, Magnesium Carbonate, Parfum, Linalool, Alpha-Isomethyl Ionone, Butylphenyl, Methylpropional, Citronellol, Coumarin, Geraniol. 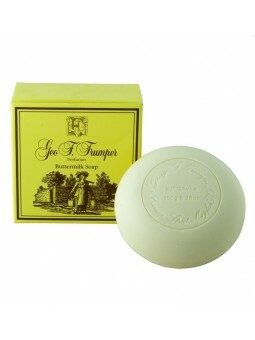 Geo.F.Trumper Traditional Buttermilk Bath Soap 150gr. A nourishing triple milled soap that contains protein rich extract from pure Buttermilk. Geo.F.Trumper Traditional Extract of Limes Bath Soap 150gr. The Famous Extract of Limes, made from only the finest West Indian Limes and combined with triple milled soap of the highest quality. Ingredients:  Sodium Palmate, Sodium Palm Kernelate, Aqua (Water), Paraffinum Liquidum, Parfum, Sodium Chloride, Limonene, Glycerin, Isopropyl Myristate, Linalool, Tetrasodium EDTA, Citral, Alpha-Isomethyl Ionone, CI 77891, BHT, Tetrasodium Etidronate, Geraniol, Coumarin, CI 19140:1, CI 19140, CI 77288. Geo.F.Trumper Traditional Sandalwood Bath Soap 150gr. A fine quality triple milled soap with our Sandalwood fragrance in a long lasting 150g bar. Geo.F.Trumper Traditional Spanish Leather Bath Soap 150gr. A high quality triple milled bath soap with the warm, heady fragrance of the Spanish Leather. Presented in a long lasting 150g bar. Ingredients: SODIUM PALMATE, SODIUM PALM KERNALATE, AQUA, PARFUM, OLEA EUROPAEA (OLIVE) OIL, PRUNUS AMYGDALUS DULCIS, SODIUM CHLORIDE, GLYCERIN, ISOPROPYL MYRISTATE, TETRASODIUM EDTA, COUMARIN, CITRONELLOL, BENZYL SALICYLATE, BHT, EVERNIA FURFURACEA(TREE MOSS) EXTRACT, TETRASODIUM ETIDRONATE, CALCIUM CARBONATE, CI 77891, CI 77492, CI 77491. 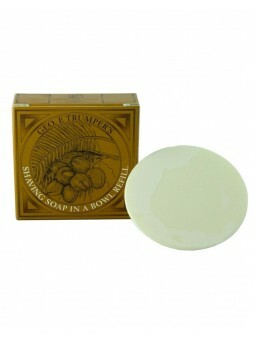 Geo.F.Trumper Traditional Wild Fern Bath Soap 150gr. A fine quality triple milled bath soap with the leafy, fougere aroma of the Wild Fern fragrance. Geo.F.Trumper Violet Hard Shaving Soap Refill 80gr. The violet hard shaving soap refill for the wooden shaving soap bowls. Ingredients: Sodium Palmate, Sodium Palm Kernelate, Aqua (Water), Glycerin, Sodium Cocoate, Parfum (Fragrance), Alpha-Isomethyl Ionone, Sodium Chloride, Tetrasodium Glutamate Diacetate, Isopropyl Myristrate, Tetrasodium EDTA, Coconut Fatty Acid, Butylphenyl Methylpropional, Hydroxyisohexyl 3-Cyclohexene Carboxaldehyde, Eugenol, BHT, Linalool, Hydroxycitronellal, Isoeugenol, CI 77007, CI 77891. Geo.F.Trumper Violet Hard Shaving Soap Wooden Bowl 80gr. The violet hard shaving soap in a hand turned wooden bowl.